Order in the next 1 hour, 9 minutes an 1 secon for same day shipping. In case the impression on your stamp has to be changed, while the stamp itself is still working well, you can simply replace the textplate by ordering a new one. Also order a new replacement ink pad together with your textplate to guarantee for a clear and precise impression. Replacement ink pads are available in black, blue, red, green, violet and two coloured red/blue. To avoid getting ink on your fingers while mounting the textplate on the stamp, we include a rubber glove with your order. 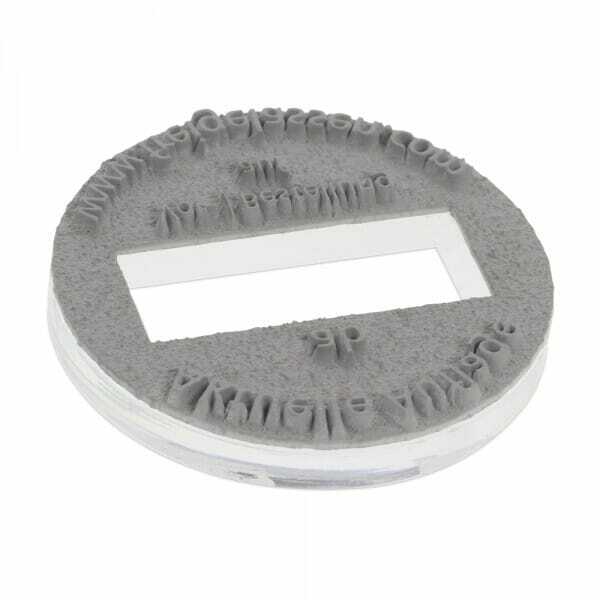 Our textplates are produced from special odourless laser rubber to provide excellent engraving and imprint quality. Customer evaluation for "Textplate for Trodat Printy Dater 46119 19 mm diam. - 1+1 line"